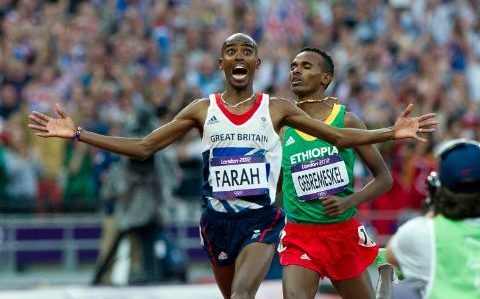 It became the image of London 2012: Mo Farah crossing the finish line, arms outstretched, eyes wide in disbelief as he won his second gold. 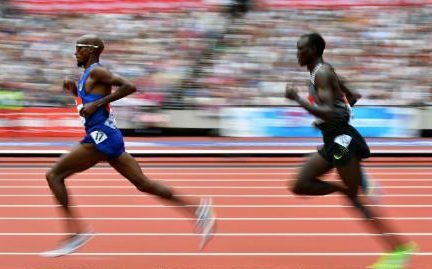 Now, as he prepares for what will almost certainly be his last Olympics in Rio De Janeiro, Farah is hoping to repeat his success and win both the 5,000m and 10,000m – a feat that would make him Britain’s greatest athlete. “I remember when London got the bid [in 2005]. I stopped at a garage to watch the news,” says Farah, 33, who was born in Somalia to British-Somali parents, and moved to London when he was eight. “For seven years I dreamt of winning. And then it does happen, and you’re not dreaming. 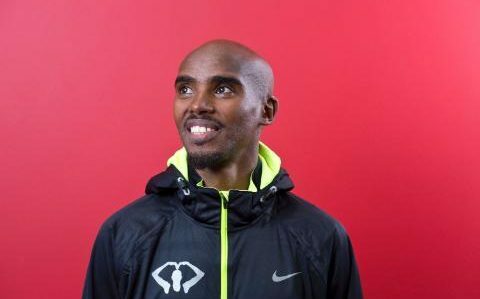 Farah became a national hero after the London Games, and admits he was not prepared for how his life would change – when at home in London, he cannot even go to the supermarket without being stopped for selfies. He has also had to get used to life in the spotlight and intense media scrutiny, which escalated last year when his coach, Alberto Salazar, was accused of giving a banned testosterone supplement to Farah’s training partner Galen Rupp, which Salazar denies. Salazar was cleared in a US investigation – Farah, who was never accused of doping, released his blood test results and has always stuck by his coach. But the experience was tough and he is not yet in celebratory mood. “People look at you differently and I just want to show people that I’m always 100 per cent behind clean sport. Understandably, he finds talk of drug use frustrating, given the extraordinary training regimen he puts himself through. Until 2011, he had been ranked fifth in his two disciplines. That year, he moved to Portland, Oregon in the US, to start training with Salazar, and quickly moved up the ranks. His schedule is certainly punishing – he runs up to 120 miles a week, uses a hi-­tech water treadmill, sleeps in an oxygen tent and switches between climates and altitudes. He never takes a day off training, even managing a five-­mile run on the one day he was sick earlier this year, and he wears out a new pair of trainers every week. The signs are good: last week, at the London Anniversary Games he stormed to victory in the 5,000m with the fastest time in the world so far this year. Farah, speaking to me from the French Pyrenees, where he is putting in some last-minute high-altitude training – running up to 20 miles each day – before Rio, says he has little time for anything else. “I’ll Skype the family, and sometimes I might play a bit of Fifa on my Play Station. But generally I’m pretty exhausted so spare time is spent resting. Farah’s wife Tania, whom he met as a teenager at Feltham Community College, and their children – Rhianna, 11, who is from Tania’s previous relationship, twins Aisha and Amani, four, and Hussein, nine months – have taken well to life on the other side of the pond. The children are developing American accents, and Farah does not know if they will come back to London even after he retires. A new BBC documentary, Mo Farah: Race of his Life, which follows him for weeks of competitions and training, sees him at home, braiding his daughters’ hair and reading to them. He had his two Olympic medals inscribed with the names of his twins, who were born just after the Games. His training often takes him away from them. “I want to spend as much time as I can with my kids, but I know the opportunities in athletics don’t often come round so I’ve just got to make the most of it,” he says. “The main struggle for me is missing them. I’m away seven months of the year. Aisha said the other day, ‘Why does Daddy run? Can’t he stop and come home now?’. Oh man, as a parent, that’s hard. “Whenever I go away, she stops eating. “That moment, growing up, I can never get it back and it makes me feel sad. Farah was born in Mogadishu and moved to neighbouring Djibouti, aged four; there, his family endured grinding poverty. His home was a shack with a tin roof; eight people slept in one room. They played in sewage­-filled streets and got up at 5am to sell samosas in the street. Farah’s mother took him to live in London with his British father when he was eight; his twin brother Hassan would have gone, too, but was too poorly to travel. A confused young Farah only realised that his brother was never coming after his parents split up and his mother returned to Africa, leaving Farah to live with an aunt in Hanworth, southwest London. The brothers were reunited after 12 years at Hassan’s wedding. Hassan spent years as a travelling milk salesman, displaced by civil war, while his brother was training to be a world-­class athlete in relative comfort in London, but Farrah says neither believes in dwelling on the past. Hassan still lives in Somalia so the brothers see each other rarely but speak often, exchanging pictures of their children. Farrah is still close to his mother Amran, who is in Somalia. “She won’t watch me on TV,” he laughs. “She’s so proud, but she doesn’t quite understand why I put myself through it. “She thinks I’m killing myself every time. When I’m on the floor after a race, she’s tearful and worried about me. Farah’s relationship with his father Muktar, which had never been close, broke down during the divorce and the pair rarely speak now; Farah has not seen him for a year. “We don’t have a relationship,” he says. “I respect him because he’s my father, but I don’t pick up the phone and call him. He has made enormous sacrifices, and now hopes it will pay off this summer in Rio. After that, he has some big decisions to make. Perhaps there is a hint in the fact he has just published his first children’s picture book, Ready, Steady, Mo!, about a boy runner. “I don’t know what I’ll do exactly but I’ve thought about it and I’d like to do something with kids in sports. “There’s a lot more potential there that we can tap into as a country.